This stink bug was found feeding on a developing seed pod of Clammy Weed (Polanisia trachysperma) at Mesquite Wash, Maricopa Co., Arizona, Oct. 2009. Harlequin Bugs are found throughout much of North America and are an easily recognizable species of stink bug. Their usual hosts are mustards including cabbage and broccoli - as such they may be pests in fields where especially a seed crop is required. They feed on developing flower buds, shoots and seeds thus reducing the yield. The bug at left was found on developing fruit of Clammy Weed - classified in a plant family (Cleomaceae/Capparaceae) that is related to the mustard family. 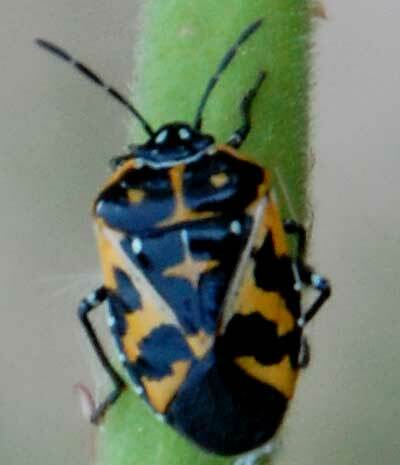 There is some variation in the patterns of orange, black and yellow in harlequin bugs, but the general pattern remains. The sharply contrasting black and bright red/orange coloration is related to the fact that these bugs sequester toxins from their host plants and store them in their bodies. If a bird were to predate one of these bugs it would likely suffer the ill effects of the toxin. Thus the bright color is a warning to would-be predators.